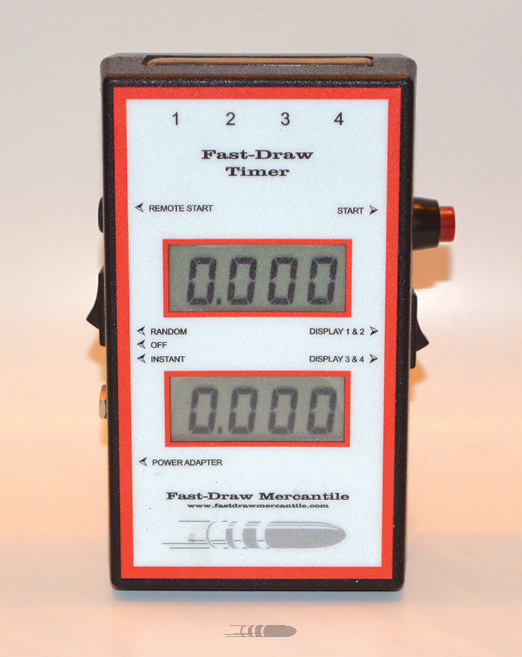 The Fast-Draw Mercantile, Durango KidTM Indoor Target/Timer System was designed allow shooters to practice Cowboy Fast Draw indoors without the noise or the smoke and odor of spent primers. This system has two major components, the Indoor Target/Timer unit and the Single Action Army (SSA) Revolver Conversion Kit. With the conversion installed, your revolver “fires’ a very brief pulse of inferred light whenever the hammer falls. The Indoor Target/Timer unit detects this pulse and then displays the shooter’s time. This system does not use lasers and is completely eye-safe. The Indoor Target/Timer unit, as the name implies, is both a target and a timer for a single user. It has two Red LED stage-draw indicators, an inferred receiver to detect the incoming pulse of light, and a 4-digit LED display to show the shooter’s time, all in one small enclosure. The two LED’s will activate and flash 4 times to let the shooter “stage” and then go off. At the end of a random time delay these indicators will activate again and the 4 digit display will start to count up from 0.000, they will stop counting up when a light pulse from the gun is detected. The system will automatically reset and start over. The Indoor Target/Timer can detect the incoming inferred light pulse from as far as 20 feet away. Even though the detector is small, the light pulse is just wide enough, so that the accuracy required to hit the target is comparable to that required to hit a 24 inch round target with wax bullets. The Indoor Target/Timer unit is powered by a 5VDC, 120VAC AC/DC adaptor (supplied). The SSA Revolver Conversation Kits are designed for each specific manufacturer of revolver and caliber. These kits consist of a replacement cylinder, an electronic module, a battery and an insertion/extraction tool. The cylinder contains the circuitry to sense the fall of the hammer and generates the inferred pulse of light. The replacement cylinder weighs about 2 ounces less than the manufactured cylinder for your gun. The conversion is not permanent; the original cylinder can be re-installed in your revolver in just a few seconds.